I've been asked to project what our library staffing needs will be post-set-up phase (as we are in Year 3 of a brand-new school with one more year of expansion). Please fill out the form below if you are a fully-established middle or high school library in an international school. Don't forget to hit the Submit button at the bottom. Many thanks.... I've made it so everyone can see the results right after you complete the form. UPDATED Sep 6: Here is a direct link to the spreadsheet of results. 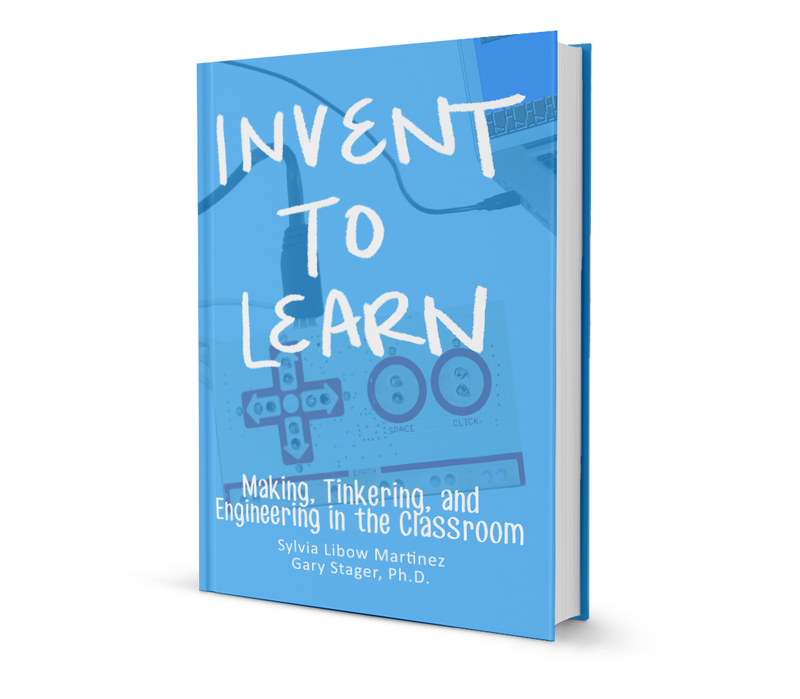 If you want to have a good read about the history and future of the "making" movement in education and tinkering as "a mindset for learning," I highly recommend the book "Invent to Learn: Making, Tinkering, and Engineering in the Classroom -- by Sylvia Libow Martinez and Gary Stager. Go to their website for an overview of the chapters, with links to extended resources for each. 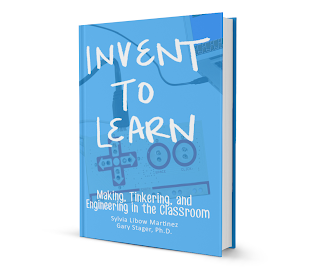 I also refreshed my acquaintance with the writings of Mitchel Resnick (head of the MIT Lifelong Kindergarten group) re the cycle of imagine, create, play, share, reflect, imagine. And a biography of Nikola Tesla is on my "to read" list. 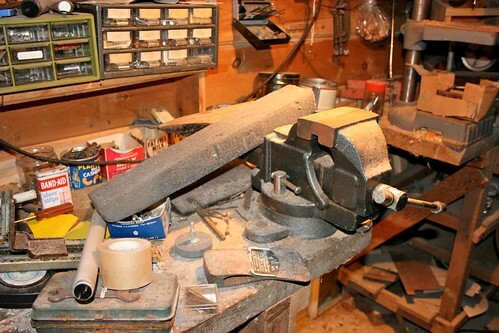 Reading the book, I remembered my father's workshop down cellar in the house in Maine where I grew up. We loved to make things with him. My biggest project was a bookcase that would double as my bed's headboard. Mainly we marveled at how he could fix things. 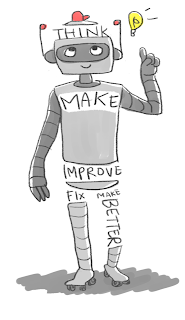 He was definitely a tinkerer. A few years ago it was time to clear the workshop out. After all, he'd been dead for some twenty years and no one was using it. But I took some last photos. I started this year's ALA* (#ALA2013) experience with two very practical all-day pre-conference workshops. Library Makerspaces: The Field Trip -- at the Chicago Public Library, which focused on the spaces being created to allow kids to experience hands-on tinkering, especially with flexible, inexpensive digital/electronic components. Various people presented, on various aspects. All-day interesting. Separate blog post coming. RDA: Back to the Basics -- which explained, in illuminating detail, the benefits to libraries of the new metadata Resource Description and Access standard and how to gradually implement it via existing MARC data records. Welcome, worthwhile. Separate blog post coming. 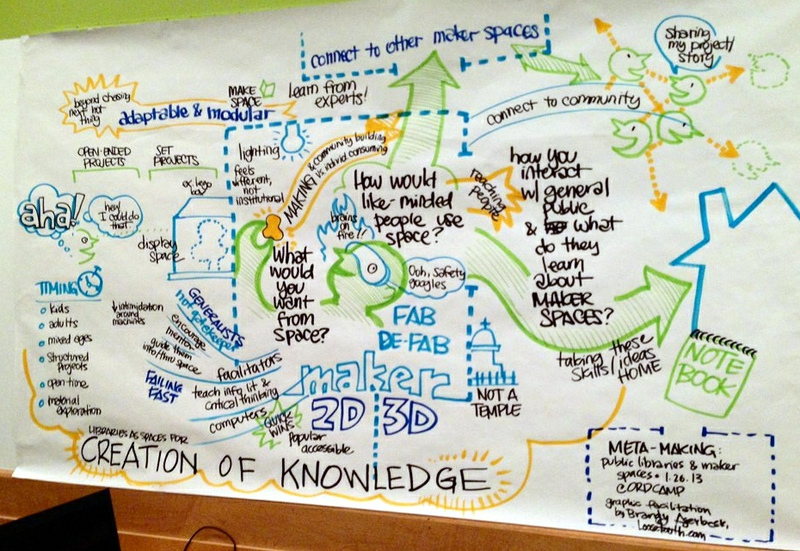 Crossing the K-20 Continuum: Are Librarians Bridging Information Literacy and 21st Century Skills? -- a panel discussion by Kenneth Murhanna, from Kent State University, director of the TRAILS project and author of the new book, Informed Transitions: Libraries Supporting the High School to College Transition -- see his presentation slides ("Battling the Unready") here -- and Tasha Bergson-Michelson, a Google Search Educator moving in September to a girls-only high school in Palo Alto (http://library.castilleja.org/) -- see her presentation slides at bit.ly/SearchSources. 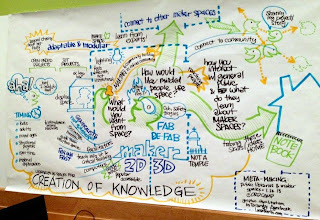 Friction: Teaching Slow Thinking and Intentionality in Online Research -- a presentation by Debbie Abilock (NoodleTools) and Tasha Bergson-Michelson again (see above). See presentation slides here. Not only was I thrilled to finally meet Debbie in person, having known and interacted with her online for years, but this was one of the few sessions which managed to involve the audience effectively. If you go to http://bit.ly/FrictionALA, you can get links to the ten Google Docs used to record the small group discussions. I liked the idea of focusing on "friction points" in the research process -- where students could or should be prompted to use System Two thinking (as in Daniel Kahneman's book, "Thinking, Fast and Slow" - one of my favorites). More on on this in another blog post. Studying Ourselves: Libraries and the User Experience -- a panel presentation by a professor and two university librarians, each of whom had studied the library environment -- and students' use of the library -- using sociological and/or anthropological research methods. The sociology professor, Andrew Abbott, was particularly fascinating. Again, more in another blog post. LibrarARy Orientation: Augmented Reality in the Library: Reality -- a quick session by the University of Houston librarians on how they are using Aurasma, a free augmented reality app, to enhance their library orientation sessions. Click here for their Prezi presentation. I had already played with Aurasma and found it interesting to see how they were using it. More on this later. Bleak New World: YA Authors Decode Dystopia -- a panel discussion by four top-notch dystopia authors, from old to young: Lois Lowry ("The Giver"), Cory Doctorow ("Little Brother"), Patrick Ness ("The Knife of Never Letting Go"), and Veronica Roth ("Insurgent"). As Ness said, the best YA books promote the question, "what would you do if....?" And another of them said, dystopia is not a story, but a way to tell a story. 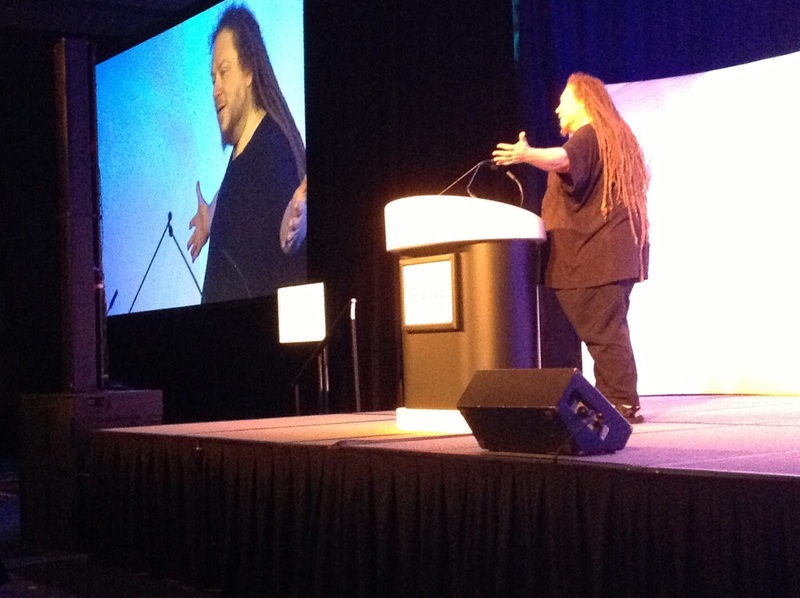 Jaron Lanier: Who Owns the Future? -- An auditorium presentation by a major player in the making of today's digital world, unafraid to criticize it with compelling economic arguments in his new book. Also thoroughly charming. I'm a long-time follower of his thinking, so I felt like it was a fireside chat with an old friend, bringing up scary topics (too true, big data is a big danger), but also reassuring that we can change history by raising awareness at critical moments. (What a lovable hippie....). Google him for all kinds of resources, starting with his homepage. Ping Fu: Bend Not Break -- An auditorium presentation by a woman who grew up in the worst of China's Cultural Revolution and today is a cutting edge American entrepreneur in the 3D digital "maker" space, thanks to her company, Geomagic. Her story is fascinating - as she started out doing comparative literature in China, while computer science was her ticket to success in the States. 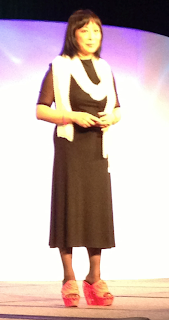 In the photo below, note her her shoes and scarf are both 3D-printed objects. For more info re her book, see her website: bendnotbreak.com -- though she has come under a lot of scrutiny for some of her depictions of the Cultural Revolution. Has she exaggerated or mis-remembered? Google it yourself, if you're interested in the controversy. I still enjoyed listening to a rags-to-riches-via-technology American immigrant woman on stage -- and hope some of my students will read her autobiography. Beyond Genre: Exploring the Perception, Uses, and Misuses of Genres by Readers, Writers, etc. -- a panel discussion by three popular writers (for adults, not teens or children) -- crime novelist Laura Lippman (wife of David Simon, if that name means anything to you fans of "The Wire"), Margaret Dilloway, and Naomi Novik, fantasy writer and analyst of fandom fiction. All new-to-me authors. The comments that stuck with me include: "Never forget, literature can be done within genre; the author is potentially limited, not the form." Also a reminder of the benefit of genre lists, i.e., booklists that help young people in a library looking for the next thing to read. NB: Since the session the organizers have posted a long list of resources related to genres -- it's well worth a look: Beyond Genre: Research and Trends PDF. Next year ALA is in Las Vegas, a place I would normally not go near. Now it sounds quite attractive. *ALA - the American Library Association's annual conference, held at the end of June (convenient for those of us on the northern hemisphere school calendar - and for me regularly winging my way from Singapore to Maine - so any US city is "on the way".... this year it was Chicago...). 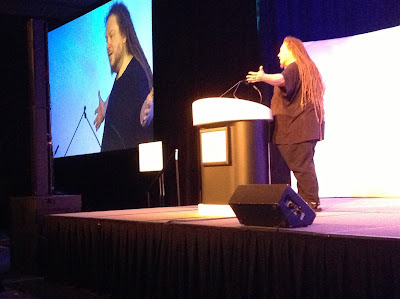 A conference that attracts 26,000 librarians/attendees. Yes, think mega-library. Below is a photo which gives an idea of the expanse of the exhibition space -- which I navigated, iPhone in hand, snapping books and ideas to pursue later.